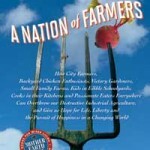 We are reading A Nation of Farmers by Sharon Astyk and Aaron Newton for the March Book Group (Intro and Chapters 1-3). Book group will be held on Wed. March 23 7:30-9pm at 330 32nd Ave E Seattle, WA 98112. It will be a discussion AND potluck! Any questions, please email elisabet.eppes@gmail.com.